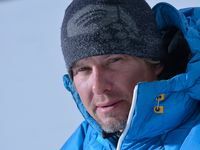 The following is a guest post by Mike Libecki, National Geographic Explorer, and brand ambassador for Dell Latitude Rugged. He is an adventurer, humanitarian and father. My daughter Lilliana recently turned 13 years old. Suddenly, she is ready to change the world. 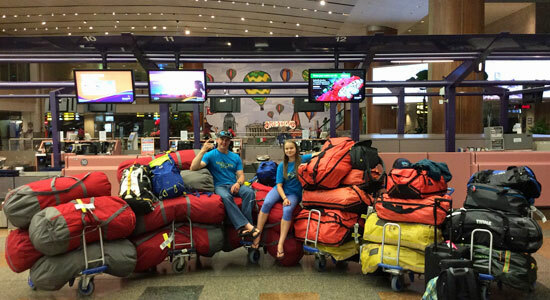 At only 13 years old, she has already been to all seven continents on the globe and 21 countries. One of the best lessons for her is to see the world and be inspired to make it a better place, ultimately creating and sharing joy in any way possible. Lilliana has grown up with a dad who lives the life of climbing and expeditions as a National Geographic Explorer; a life of traveling to exotic countries and remote desolate lands, all the while pushing the boundaries of climbing first ascents and grand adventures. If you step into our house, you might feel you are in some kind of museum with carvings, bones, paintings and rugs from around the world. Through growing and living in this environment, it’s only natural she wants to live a similar lifestyle. By the time she was 11, she had traveled with me to 15 countries and six continents, and became the youngest girl to do a ski expedition to Antarctica. But to Lilliana, her ultimate goal involves more than conquering new landscapes and surmounting great mountains, as she wants to combine the adventure with helping those in need. At just 11, she decided she wanted to try to climb Mount Kilimanjaro, Africa’s highest peak and one of the world’s notorious “Seven Summits.” She had learned through her research that there were many orphanages in need in the area. Through a friend at The Human Outreach Project, we found an orphanage in Tanzania near the base of Mount Kilimanjaro called the Kilimanjaro Kids Community that was in desperate need of power, electricity and technology for education. Our plan was to first climb Kilimanjaro, then go to the orphanage and install new solar energy and computers. Through coordinated efforts with Dell and solar energy company, Goal Zero, we were able to deliver all the necessary solar panels, solar generators and Latitude laptops to bring sustainable energy to the orphanage and community. The experience at the African orphanage changed Lilliana’s life. When we returned from Africa, she immediately started researching others ways we could help the planet and people. It was her calling. You can enjoy a video of our experience here. In 2015 when earthquakes hit Nepal, it devastated the region, and Lillianna wanted to help. In response to the catastrophe, we began figuring out what the problems were in Nepal and what resources they needed most. We reached out again to our friends at the Human Outreach Project, Goal Zero, and Dell, and started planning our expedition to deliver supplies and aid to the lower Solukhumbu Valley and Sagarmatha National Parks in Nepal. 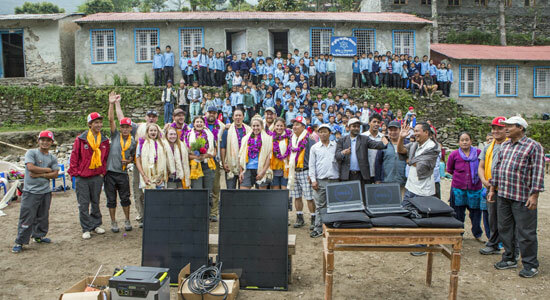 While Goal Zero provided support and products for the solar energy needs, Dell, as part of its continued commitment to provide underserved youth with better access to technology, donated additional funding and Latitude laptops to help these communities rebuild. We shipped most of the equipment, but also checked in over 30 bags of additional product for the local people, including thousands of socks, fleece hats, sleeping pads, eating utensils, tools – the list goes on. Our total journey involved trekking more than 80 miles, enduring altitude, rain, and humidity. We witnessed people still rebuilding stone buildings and walls from the earthquake last year, but it did not affect their warm treatment toward us with many greeting us with “Namaste” along the way. We installed more than 5,000 pounds of solar panels and generators, along with internet modems and 20 Dell Latitude laptops at the schools, hospitals, dental clinics and community centers. Some of the most remote and in-need in the world. My daughter, Lilliana Libecki, said, “We were there to give the gift of joy and help better the quality of lives of the Nepalese people in general and that suffered from the Earthquake last year. What I did not realize, is that it was me (us) that received the gift of joy by being able to help them. They were so grateful, kind and humble. This experience changed my life forever. I am so inspired that I now just started my own nonprofit organization “The Joyineering Fund” to continue the humanitarian work. My daughter once again planted the seed for a huge humanitarian project that would enhance the quality of thousands of people’s lives. “In a world where we can be and do anything, be kind and do good.” – Lilliana Libecki, 13 years old, founder of the Joyineering Fund, a nonprofit humanitarian organization. National Geographic Explorer and Dell Rugged brand ambassador Mike Libecki has explored the most exotic and untouched places on planet seeking the most difficult climbs and first ascents that exist. Mike relies on Dell Rugged technology to perform in the harshest environments on the planet. He also does humanitarian expeditions that include bringing technology to remote cultures and people, including schools, orphanages and hospitals from Africa to Nepal. He is addicted to exploring the most mysterious and untouched areas on the planet. Mike has multiple first ascents and solo ascents on big rock walls and towers from Afghanistan to Antarctica on 70 expeditions and nearly 100 countries including notoriously risky and intensified environments. Mike is on track to achieve a life goal of 100 expeditions by the time he is 100 years old! Lilliana Libecki, said, "…What I did not realize, is that it was me (us) that received the gift of joy by being able to help them. They were so grateful, kind and humble. This experience changed my life forever." The gift of Joy. Happy December.